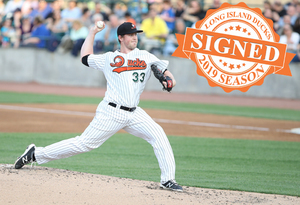 (Central Islip, N.Y., Feb. 5, 2019) – The Long Island Ducks today announced the signing of right-handed pitcher Tim Melville. He begins his second season with Long Island and 11th in professional baseball. Melville first joined the Ducks at the beginning of the 2017 season. He made nine starts with the club, posting a 3-4 record with a 3.45 ERA, one complete game, and 48 strikeouts to just 18 walks over 47 innings of work. His signature performance came on June 7th at New Britain when he tossed six scoreless innings and struck out 14 batters, tying the franchise’s single-game strikeouts record. The Virginia native’s contract was purchased by the Minnesota Twins organization three days later. After going 4-3 with a 2.70 ERA in 11 games (10 starts) with Triple-A Rochester, he was promoted to the Major Leagues by the Twins on August 21st, making him the 16th player in Ducks history to reach MLB after playing on Long Island. The righty was also called up to “The Show” in September by the San Diego Padres after being claimed on waivers. The 29-year-old spent the entire 2018 season with the Norfolk Tides (AAA, Orioles) of the International League. He made 40 appearances (14 starts) and recorded a 9-6 record, four saves, and 82 strikeouts over 104 and two-thirds innings of work. He first reached the big leagues as a member of the Cincinnati Reds in 2016, making three appearances (two starts) with the club, and he has also spent time in the Kansas City Royals and Detroit Tigers organizations. Melville was originally drafted by the Royals in the fourth round of the 2008 amateur draft.